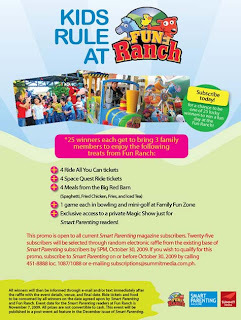 Be 1 of the lucky 25 families to enjoy a day's fun treat at Fun Ranch when you subscribe to Smart Parenting (subscribe by email or calling 4518888 local 1081/1082) on or before October 31. Event date set for Smart Parenting readers is on Novermber 7, 2009. This contest is also open to current subscribers.